I am super excited that today is finally here, because I get to share my creations for the Sew Americana Blog Tour! I have never participated in a holiday-themed blog tour before, and it has been tons of fun! 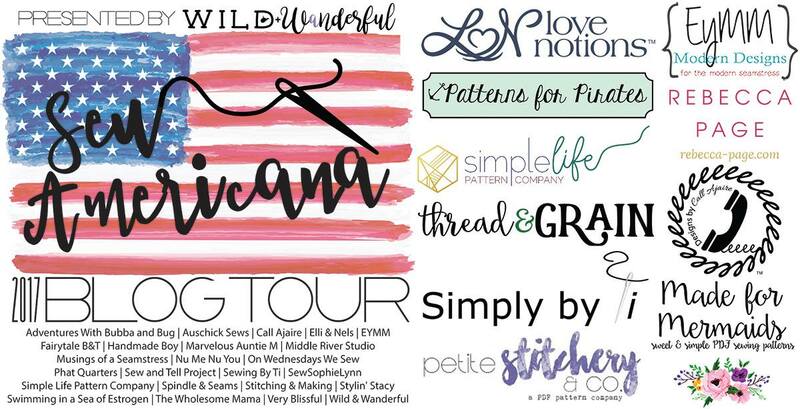 The Sew Americana Blog Tour is hosted by Katy at Wild & Wanderful, and she is ah-ma-zing! Be sure to read all the way to the end to see the list of fabulous bloggers participating. The Fourth of July is one of my favorite holidays – I mean, hello, ‘Merica! I have never made myself any “Americana” themed clothing before, and I immediately started planning what to make. 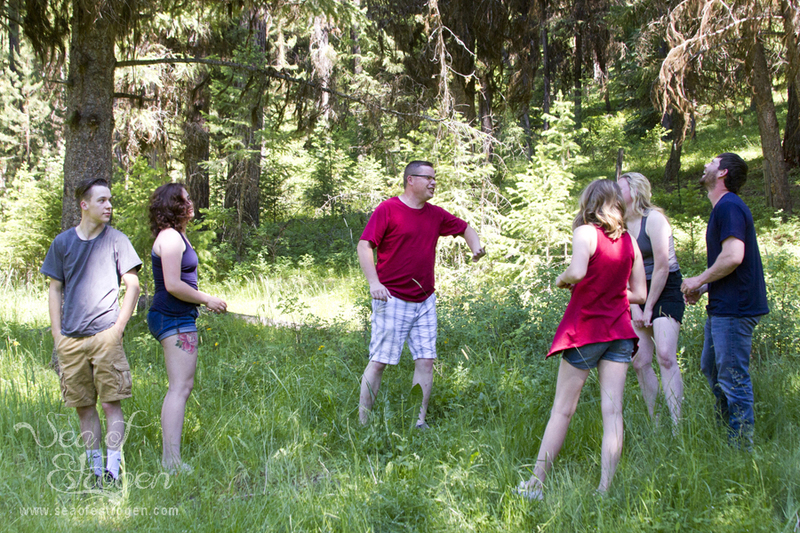 For some reason, I started thinking about family pictures, and I realized that we have not taken ours since Emma & Jordan got engaged, nearly two years ago! 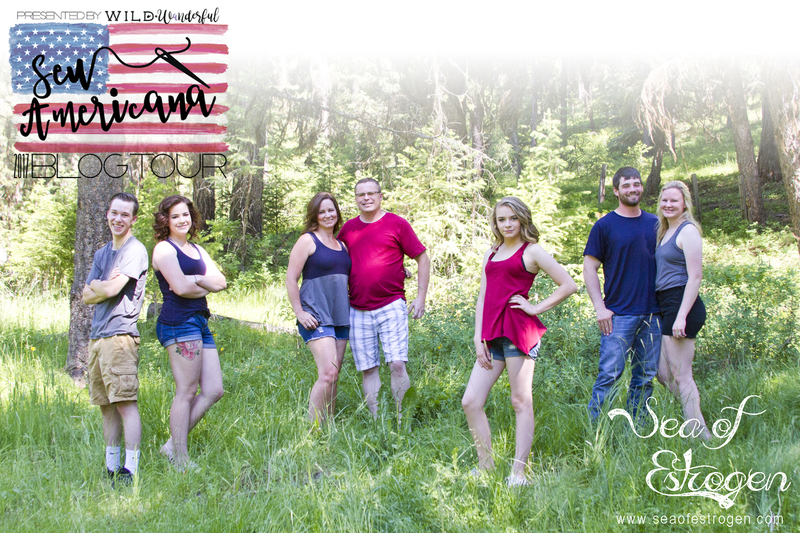 I decided I would make something for each of us, and we would take family pictures in them! The trick is arranging our schedules so all seven of us can be in the same place at the same time. 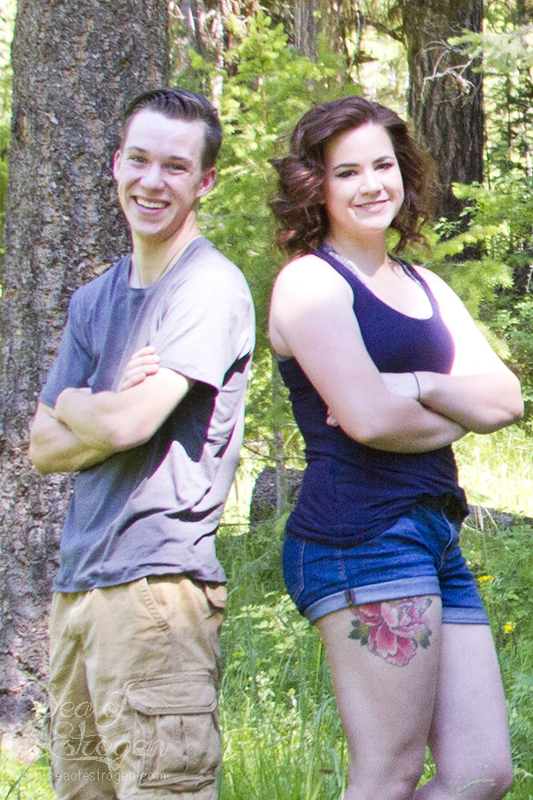 Emma and Jordan live two hours away and both have full-time jobs. Harley and Terrance both have summer jobs. 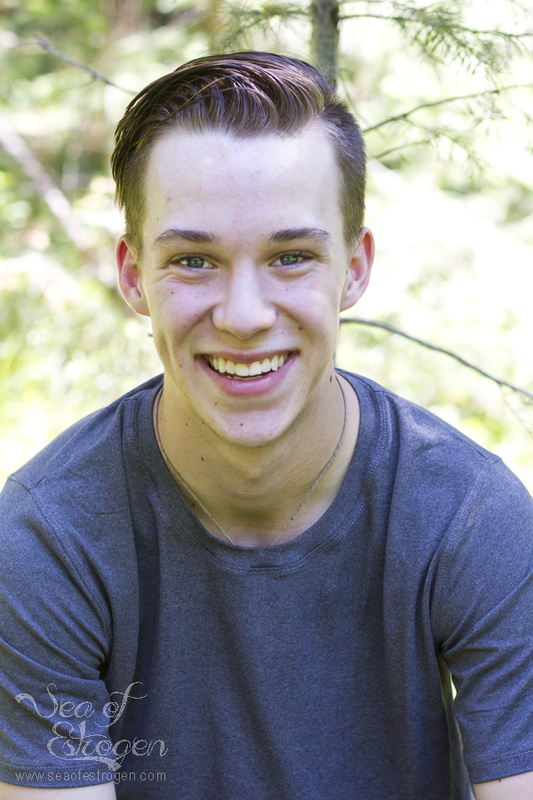 Reagan is crazy busy working on three musicals this summer. 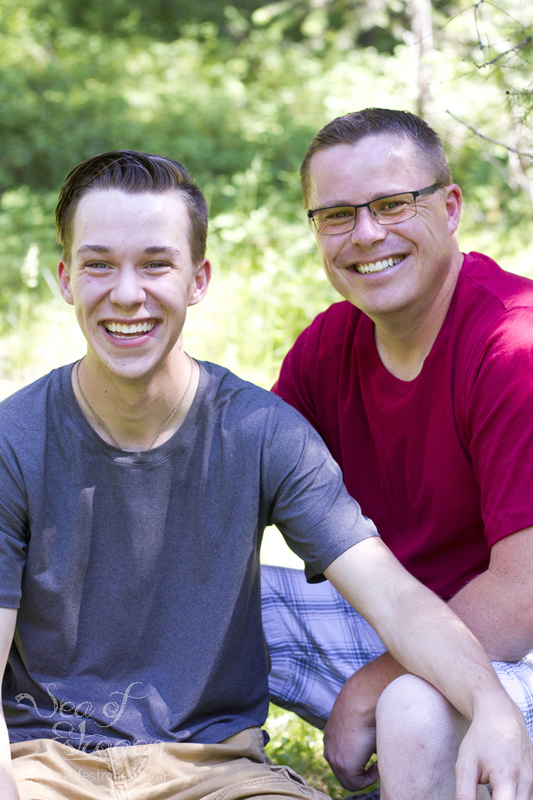 Todd and I both have busy schedules, so our time is limited, as well. 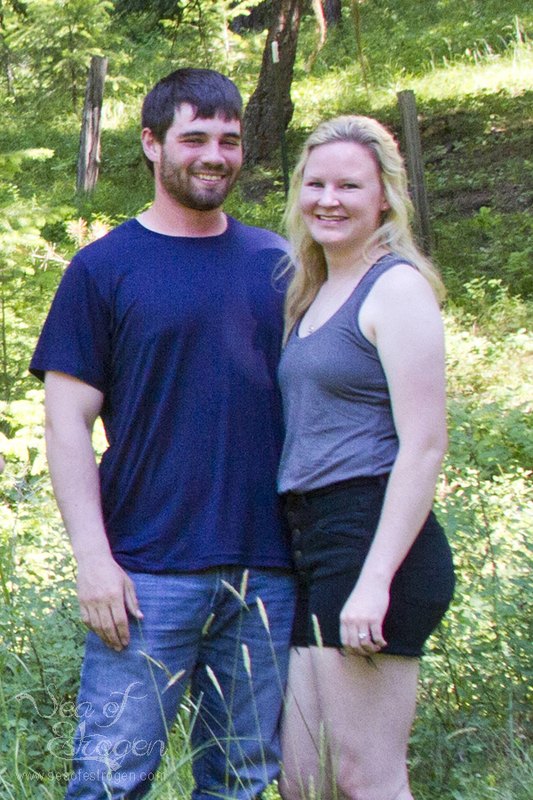 We arranged to meet in the tiny little town of Ukiah, Oregon this last Sunday to take pictures. It worked out perfectly because it’s about an hour drive for us and Emma & Jordan. All the patterns I used to create our shirts are from Patterns for Pirates. Todd, Terrance, and Jordan are all wearing the Men’s Henley in double brushed poly from So Sew English Fabrics. The pattern includes a basic t-shirt pattern without any add-ons. I have not made any clothing for Jordan or Terrance before, and both said they would gladly take more. I love that I can make items that fit correctly. Jordan said he liked the length of his shirt because he is can lift his arms without exposing his stomach. Harley and Emma are both wearing racerback Essential Tank Tops. For Harley’s I made the straight hem version, and Emma’s is the curved hem version. These are also made from the DBP from So Sew English Fabrics. 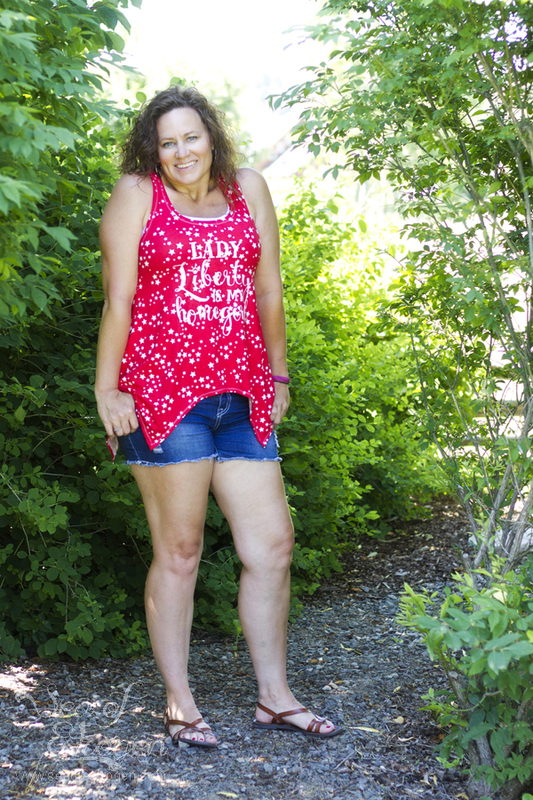 As part of this blog tour, I received a complimentary copy of the Free Spirit Tank Top pattern, which I had never made before. Let me tell you, this tank is awesome! There are tons of options, and it is perfect for warm summer months. I envision it layered with cardigans during cooler weather, as well. The options include a full back or racerback, four lengths: cropped, shirt, tunic, and dress, and there are four different hemlines: side dipped, high low, hankerchief, and curved. Reagan’s tank is the full back shirt length with side-diped hemline, and mine is the full back shirt length with the curved hemline. I also color blocked mine to include both gray and navy. 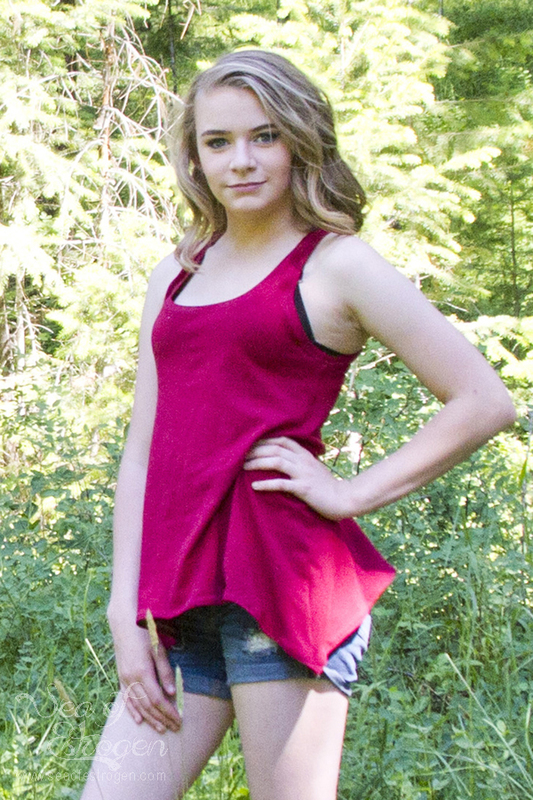 This tank is semi-fitted at the bust, and it flares out for a flowy fit over the waist and hips. Just for fun, this is the type of image I find on my camera when I’m trying to get the wireless remote to work correctly. 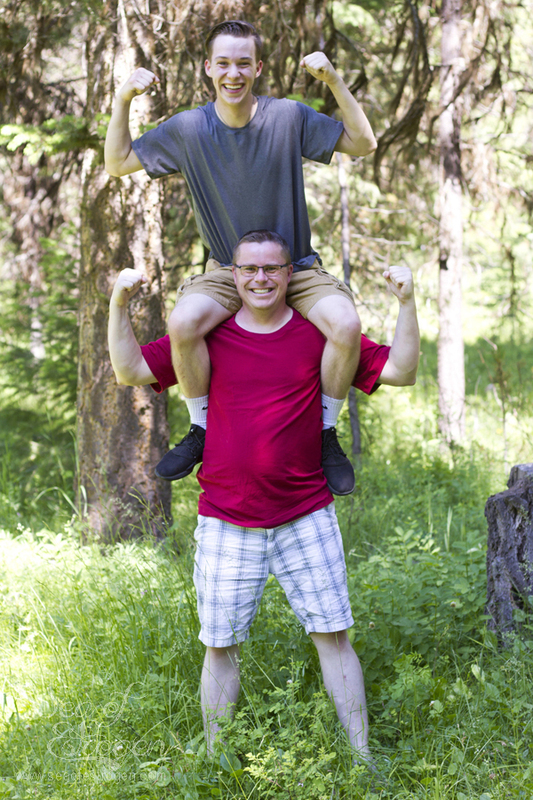 I am thrilled with our pictures, and I am even more thrilled everyone’s shirts fit correctly. I can’t wait to update the pictures in our house! When I first signed up for the blog tour, I purchased several iron-on transfers from Katy’s shop, Thread & Grain, but my family wasn’t very enthusiastic about wearing them. Sometimes they can be a little boring conservative in their clothing preferences. 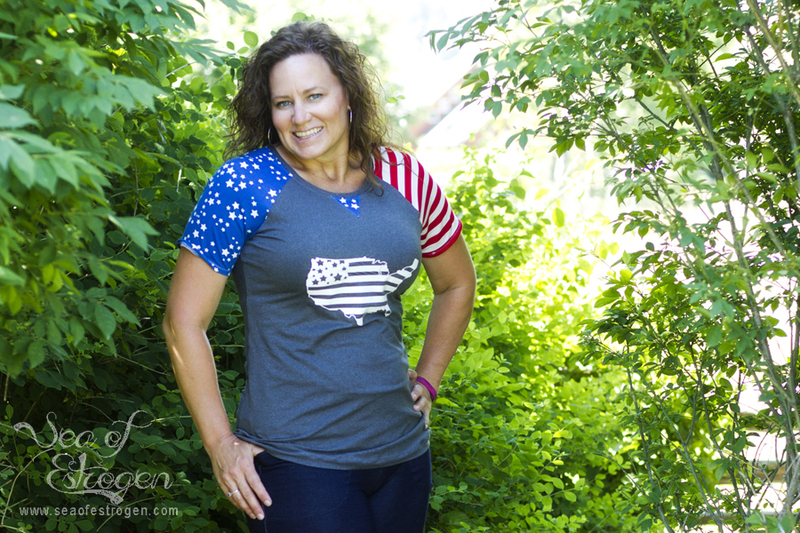 😀 I decided I would still use them, and so I made myself three shirts to celebrate Independence Day. All three of these shirts are from Patterns for Pirates, as well. It’s funny to me, actually, because they call me the “fun sponge”, yet I am the only one who is willing to wear “fun” shirts in public. The first shirt I made for myself was the Favorite Tee. 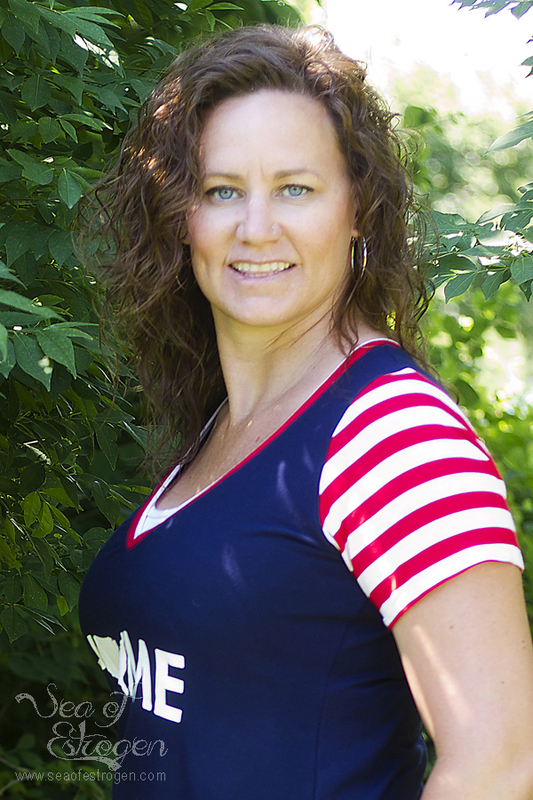 I used a navy rayon spandex for the body, and red and white striped rayon spandex for the sleeves. I added a full band to the bottom instead of the knotted band from the pattern using the stripes, as well. For this version, I applied the Home of the Brave iron-on transfer; however, I cut the phrase “of the brave” off the bottom of it so it just reads “HOME”. In addition to the shirt, I also made a pair of SOS Knit Pants cut to a long short length so they would be appropriate to wear to work. I made them using some indigo denim jegging fabric from Peek-A-Boo Fabric Shop. 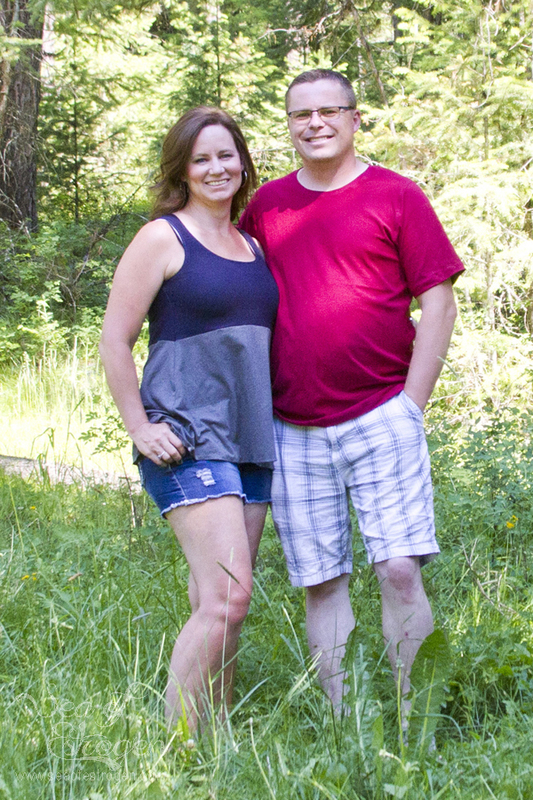 They are the most comfortable pair of shorts I own – almost like wearing pajamas! The Slim Fit Raglan is the first pattern I purchased from Patterns for Pirates, and it is definitely one of my favorites. It is comfortable, easy to make, and has tons of options. This shirt is made using charcoal DBP for the body. 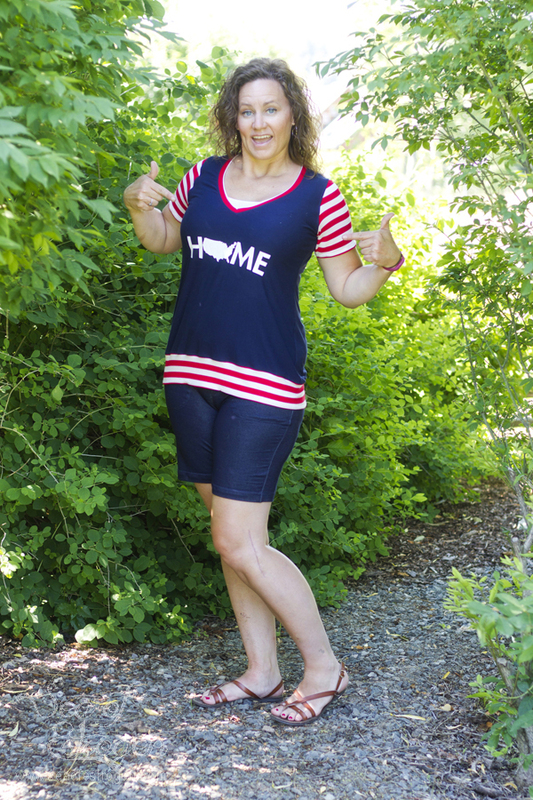 I used the same striped rayon spandex from the Home of the Brave shirt for one sleeve, and I used the blue “little stars” DBP for the other sleeve and the front triangle. 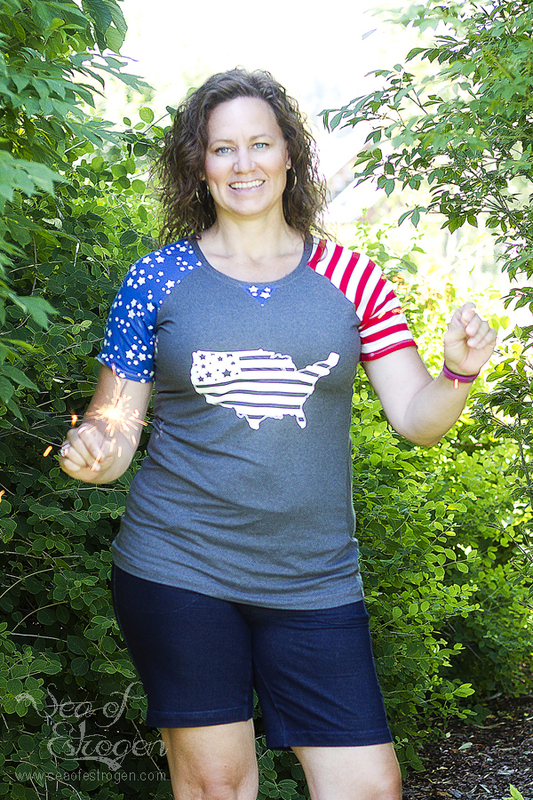 The Stars & Stripes iron-on was easy to apply and is a perfect fit for my “stars & stripes” shirt! 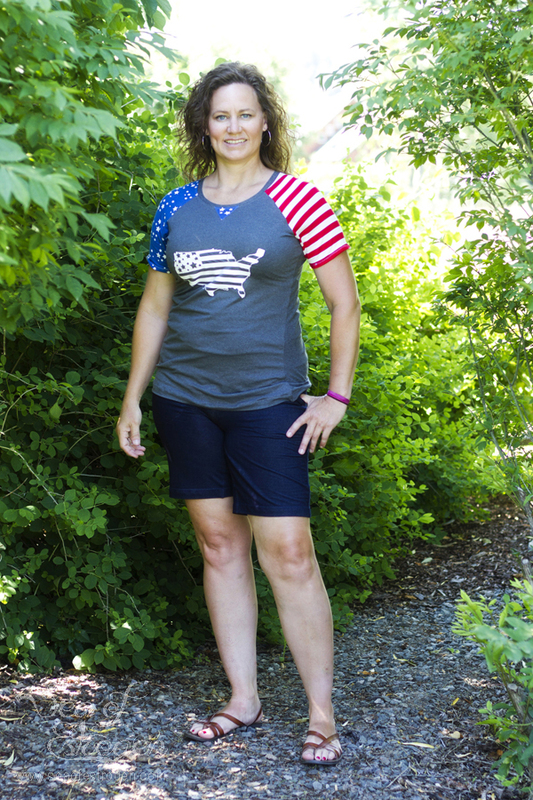 My final shirt is a racerback Free Spirit Tank Top with the hankerchief hem. 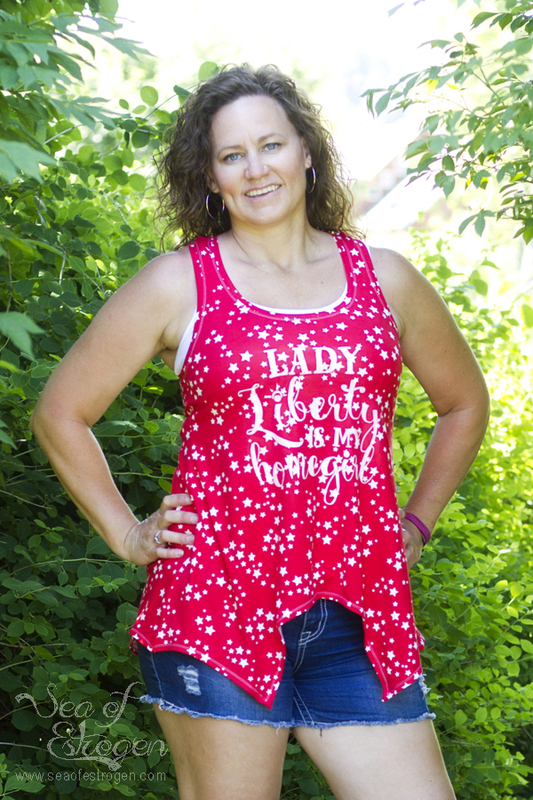 I used red “little stars” DBP to make this shirt, and I applied the Lady Liberty iron on to this shirt. I love that the shirt is just busy enough that you really have to look to read the transfer. We are going to a (somewhat) local flea market this weekend, and I can’t wait to wear this tank! Oh man, where to start? Your family is beautiful, Amy!! 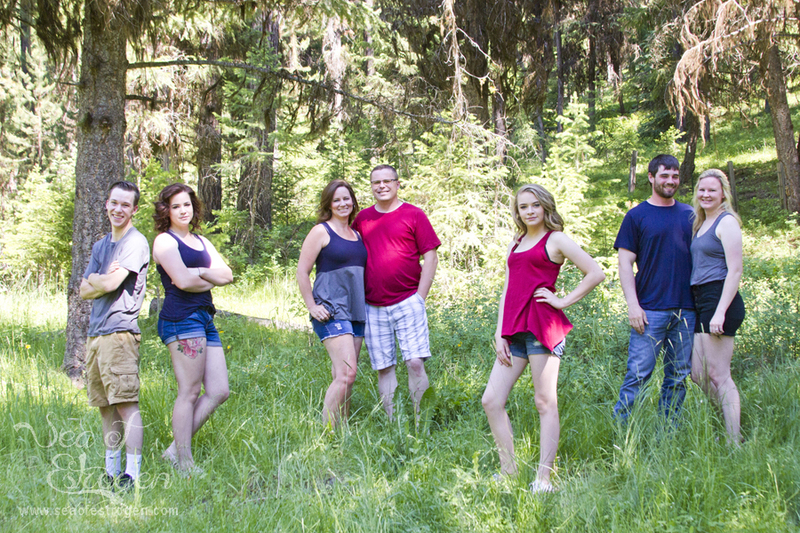 I love that you turned this into a family photo opportunity for all of you. I swear blogging and sewing has allowed for more photos of the three of us than I’d probably have otherwise. I also have one of those “I’d just rather have a plain tee” people in my house. But I’m glad that you got to use the decals for yourself anyway. Now you have ALL the fun tees in your closet!! I think the final FST with the handkerchief hem is my ultimate favorite. So cute!! Awe, thank you so much! I am pretty proud of our family. Our kids are amazing! It’s a toss up for me between the hankerchief FST and the SFR with the different sleeves. I love them both! Thank you! 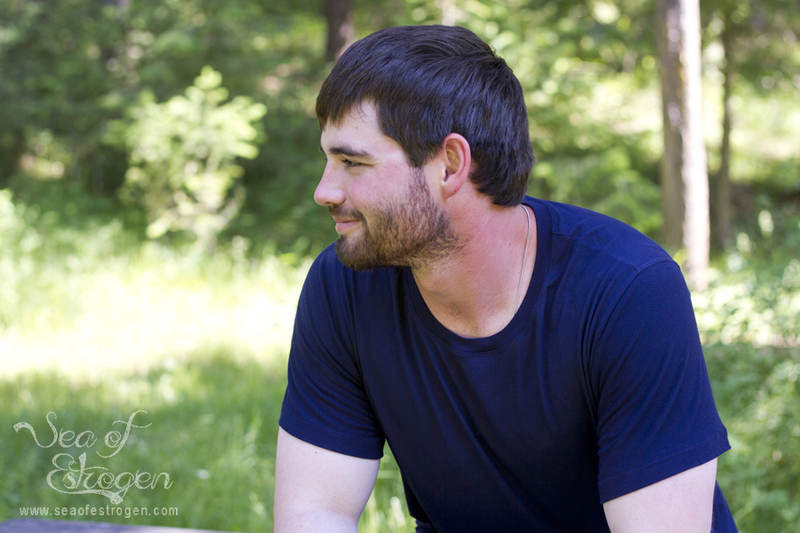 The guys really loved the feel of the DBP, I’m pretty sure it’s going to be my staple for their shirts from now on. Haha! You have a great family and props to you for dressing all of them! I, for one, love your fun shirts. Thank you very much, Meriel! I can’t wait to wear my fun shirts! I love how versatile your family shirts are! My fave is that stars and stripes shirt though!! Gorgeous! Thank you, Victoria! Originally, I was thinking the Lady Liberty tank was my favorite, but after a few days, I’m leaning more towards the Stars & Stripes, too! Wow, a lot of sewing! Great job on the tops for everyone, and getting them all together for photos. I love the extra shirts you make for yourself, too. Very fun! Thank you, Stacy! Now I just need to find the time to wear them all! I love this photoshoot and all the fun tops you made! Fantastic job!